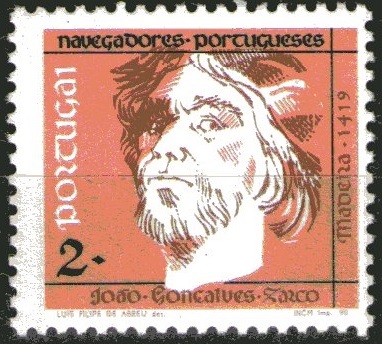 João Gonçalves Zarco ( c. 1390 – 21 November 1471) was a Portuguese explorer who established settlements and recognition of the Madeira Islands , and was appointed first captain of Funchal by Henry the Navigator . Zarco was born in Portugal , and became a knight at the service of Prince Henry the Navigator 's household. In his service at an early age, Zarco commanded the caravels guarding the coast of Algarve from the incursions of the Moors , was at the conquest of Ceuta. Zarco distinguished himself as a military hero in the campaigns of Ceuta and Tangier and became also an expert sailor in the Portuguese caravels in the southern part of Portugal and also along the north cost of Africa . Because of his maritime experience Prince Henry sent him together with Tristão Vaz Teixeira to go in search of “some islands in front of the African coast that appeared drawn in old maps.” In 1418, João Gonçalves Zarco and his sailors took sail along the northwestern coast of Africa but their caravel was caught by a storm and they were lost at the high sea for several days, until they arrived at an unknown island.They named it first Devine Spirit but then changed its name of Porto Santo, meaning Salvation Port, because it saved their lives.After examining the island that had no human inhabitants they returned to Portugal and reported the good news to their master Prince Henry, who became very enthusiastic and asked them to go back again in the following year in 1419. But this time they took with them another member of Prince Henry's House, a fellow named Bartolomeu Perestrelo. This time they went to colonize the new island of Porto Santo . From the island of Porto Santo they observed on the horizon that on southwestern “there was always a permanent dark cloud”, but the sailors thought that could be smoke coming from hell were the bad souls were burning… But at the beginning of the summer, one day that was more clear, João Gonçalves Zarco got his courage together with his sailors and went to check that “dark cloud” and they were overwhelmed with want they discovered. They found an island covered with vegetation and so much wood that they named it Madeira which means wood in English. They thought they had found Paradise ! He founded the city of Câmara de Lobos . He was granted, as hereditary leader ( Capitania ), half the island of Madeira (the Capitania of Funchal , being its first Captain). 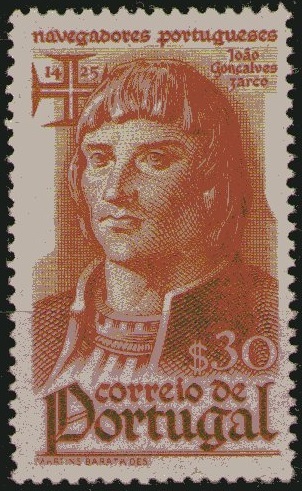 Together with his fellow fleet commanders, Tristão Vaz Teixeira and Bartolomeu Perestrelo , he started the colonization of the islands in 1425. In his role of knight of Prince Henry the Navigator 's house he participated in the siege of Tangier , in 1437, which ended in failure. He died at Funchal . A statue of Zarco stands on the Avenida Arriaga, one of the main streets in the Madeiran capital of Funchal. http://www.dightonrock.com/joaogoncalve ... sthero.htm. From Wikipedia, the free encyclopedia.